Sun Signs predictions have been published in newspapers and magazines since 1930 and though most of us strongly refuse to believe in astrology, yet we tend to glance through the Horoscopes Pages of the newspapers. 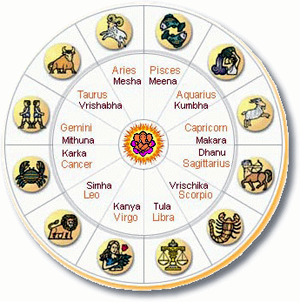 The Zodiac is divided into 12 Sun Signs and each individual fits into one of these according to date of birth. The Sun Sign horoscopes in the news papers or television programmes are “General” for each sign and should be read in that mode. Your Sun sign represents the sign of the Zodiac that the Sun was in at the time of your birth. The Sun rules willpower, ego, individuality, courage, confidence and the unique life path an individual is destined to follow. The position of the Sun in your Birth Chart (Horoscope) to glimpse your character and coming events and your determination to accomplish your goals in life. August will prove to be a month of fun & pleasure and tensions. Career front might pose hurdles and obstructions whilst arguments with workmates and superiors may ensue mid month. Avoid gossips at workplace and stay on the right side of bosses or you may mar your chances of promotion and recognition. Relationships and romance are to the fore and you encounter many flirtatious moments. Significant changes to all aspect of your life are imminent. End the month with rest, relaxation and spending quality time with family. The planetary activity in Cancer and later in Leo influence the family zone in your zodiac, and you will be hectically involved in the domestic affairs. Focus on communications with workmates, superiors and authority. Avoid long haul travel this month both for business or holidays. Romantic opportunities come early in the month via work place or social events. Meeting and socializing with friends from the past is indicated around 20th. Some minor obstructions may crop up at work end of the month. Be careful while driving. Cash flows in plenty as the planets activate your financial zone but don’t go overboard spending it. A love affair started few weeks back, is demanding time, commitment and sincerity  it is make or break it time Gemini. August is excellent to spend time with children and family, resolve outstanding issue and create an amicable, peaceful and joyous atmosphere. Opportunities to further your career arise mid month and support from bosses boost your optimism and confidence. Take extra care with electrical appliances at home. August brings out the best in you, Cancer: charming, charismatic, humorous and jolly. Your social status and popularity peak this month and others vie for your company. Home and family figure prominent and reorganization and sharing domestic chores are unavoidable. It is ideal time to review and reassess your professional desires but avoid signing any contract till end of the month. Significant improvement if finances, happy and peaceful relationships and romance make it a lively and joyous month. Travel is on your mind and why not; a vacation to exotic shores will recoup your energy. The planetary activity in Cancer boosts your morale, confidence and optimism. Opportunities abound in career, financial and property zones and if you are fast and vigilant, you will reap the rewards and secure your future. Conflicts with work mates and differences with bosses create tensions in the first half of the month. Whilst your cash flow is on the rise, you are advised to not to make any major purchases this month. Communicate with authorities and friends in the second half will resolve many outstanding issues. Romance is the highlight this month with love and intimacy shrouding your life but if you are harsh, irrational and voracious you may wreck your loving relationship. It is fortunate period to look within, heed your intuition, let go of the past and start afresh. Finances cause few ripples around 23rd as an unexpected bill crops up. Attend to paperwork, communications and family matters before 20th to enjoy the parties and social events later in the month. Career and travel are intertwined in August. As a cluster of planet transit Cancer, their heavenly dance influences your career and pushes your professional goals to success. Early August proves to be hectic and exhaustive but serenity, relaxation and pleasure returns after 20th when your appetite for fun in unleashed. Your energy, charisma and affectedness rises to new heights and you are poised to achieve your wishes and desires. Control your temper and feelings lest you upset close relations. Have a medical checkup especially visit your optician. Romance and love bless you end of the month. Be polite and diplomatic and avoid impulsive outbursts, anger and temperament in communications. August will be very busy month and you will have to struggle to balance home life and career commitments. Early August is ideal for a holiday with the family to exotic places but be very careful whilst driving as you may be distracted easily. Romance and love blooms in the first week and you may be infatuated with a close friend. Look after your health; avoid stress and lifting heavy objects. Safeguard your money and valuables and be careful while shopping as mistakes will be made and you may lose out, but it is also fortunate period to enhance your earnings. Your energy and charisma is high early in the month and friends/relations are turning up to you for advice. Significant changes to your working pattern, change of life style and residence and relocation are forthcoming. From 23rd you are in a travel mode and wish to escape the routine and boredom. Unexpected financial luck waits in the last week. Avoid major changes to your career plans, financial affairs and do not delve into buying/selling property this month. Relationships remain intense and demanding and you may have to strive and focus hard to resolve any issues. New responsibilities at work place and demands of your partner will exhaustive, tiresome and stressful. Your popularity and social status is high in the third week and flurry of activities, personal and professional, make it a significant period. The later part of the month is ideal for communications, discussions and knowledge. August 2010 provides you opportunities to finish off projects in hand create amicable and peaceful atmosphere at home and control your finances. Review and reassess a new and avoid starting new projects, as planetary activity indicates that you will be looking to the past rather than the future. The first half of the month will arouse your sensuality and passions and some of you may embark upon a new romantic affair. Your personal magnetism and charisma remains high this month and you attract others to your fold. For most of August, especially the first half, you will embark on pleasure, fun, entertainment and ignore your career commitments. Opportunity to change your job or promotion arrives around mid month. It is ideal month to review your relationships with friends and break off the stale ones and start afresh. Finances are tight this month but you will be able to sail through the money web smoothly. Your feel stressed, restless and isolated around 24th and wish for a change of scene. How about a mini vacation?